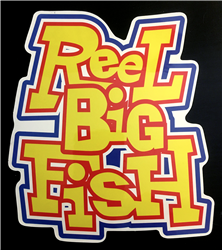 Die cut vinyl decal with Reel Big Fish logo. Semi-permanent adhesive. Die cut sticker peels away from rest of printed backing and measures approx. 5" x 6"